This picture was taken when JCCP welcome Mrs.Elizabeth Gray Vining, tutor to present Emperor (Heisei-tennou) in 1946 in Fellowship House. 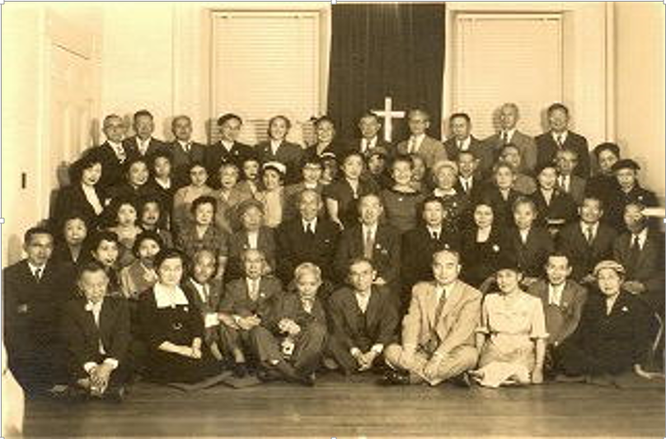 The Japanese Christian Church of Philadelphia started with a meeting in the Fellowship House on Brown Street, Philadelphia on the 19th day of November in 1944. The Charter Members were all Isseis; namely, Mr. Takashi Uchida (President), Mr.Shozo Horikawa (Secretary), Mr. Hisaki Higuchi (Treasurer). Board members were Mr. Heijiro Moriuchi, Mrs. Tome Kaneda, and Mr. Shungopictures Shimokawa. They initially called themselves the Philadelphia Christian Fellowship. Most of the members were first generation Japanese (The Isseis) just coming out of relocation centers after World War II. The first pastors were from Princeton Theological Seminary, who served alternately on the first Sunday of each month. They were Mr.Bokko Tsuchiyama, Mr. Shintaro Hasegawa who was from Delaware House Seminary and Rev. Masamoto Nishimura who was originally Pastor of Berkley Free Methodist Church, CA. They served on the second Sunday Worship Service each month. Sunday-afternoon Services for Japanese Isseis and Niseis took place bi-weekly. Rev. Nishimura came from New York every other week. He continued his ministry to the Japanese people in this area for 9 years until he was reassigned to the Free Methodist Church in Los Angeles in June, 1953. Succeeding Rev. Nishimura were Rev. Junro Kashitani from the Free Methodist Church and Rev. Suehiro from the Holiness Church both in New York, who had served our Church interchangeably on Sunday until they left for their own newly assigned Churches in 1953. After both pastors left, the Rev. Tatsuo Sakaguchi was called to become the first Presbyterian Pastor of JCCP. He was born in Fukui, Japan, in November 1887. He became the pastor of Nakatsu Presbyterian Church in Gifu, Japan, after his graduation from Kobe Theological Seminary in 1920. He and his wife then came to the United States by accepting the call from Stockton Japanese Presbyterian Church, being ordained by the Presbyterian Church in 1929. Afterward he became the pastor of Cordes Presbyterian Church and then, Fresno Congregational Church. He was interned at Alcansas Internent Camp in 1941. They came out of the camp to have arrived in Philadelphia in May 1944. He gradually became involved in the ministry of JCCP on Sundays, while he and his wife were for house work for a certain American family. The Church moved from Fellowship House which had belonged to the Society of Friend to the Barnes Center,705 Pine St., Philadelphia, in 1954, when Mrs. Kaneda moved out of Fellowship House. The first Sunday Worship Service was held at the new location on the 7th March in 1954, when Rev. Tatsuo Sakaguchi became the first Presbyterian pastor of JCCP. The Church members and friends were Mrs. Reiko Koiwai, Mrs. Hama Watanabe, Mr. Seizo Sakamoto, Mr. Albert Kajioka, Mr.&Mrs. Kazuo, Mrs. Yosie Okabayashi, Mrs. Toku Fujita, Mr.&Mrs. Hisaki, Hatsuno Higuchi, Mr. William Ishida and Mr.&Mrs. Saburo, Michiyo Inoue. They moved from the Barnes Center to a Christian Jewish Synagogue,"Congregation Beth Messiah", 1907 Chestnut Street, Philadelphia, in 1965, with the first Sunday Worship Serice held on July 4th. Rev. Tatsuo Sakaguchi was supposed to have been retired since he became 65 years of age in November, 1962, however, the congregation requested him to continue his ministerial service at JCCP. The Rev. Peter Yoshitaka Shimada was born in Kitakyushu, Japan. After his graduation from Kumamoto University he came to the United States in 1964, studying at Oral Roberts Theological Seminary and Temple University. He helped JCCP's Sunday Worship Service once a month alternately with Rev. Sakaguchi, while worked for Sun Oil Company Ltd. Rev. Shimada became a fulltime pastor in 1971 when Rev.Sakaguchi had to retire due to health reasons. They had the Sunday Worship Service in the afternoon every Sunday at Congregation Beth Messiah. JCCP became affliated with the Presbyterian Church, U.S.A. in 1979, since Rev Sakaguchi was Presbyterian and so also, was Rev.Shimada who had been a member of Narberth Presbyterian Church before he was ordained at Bryn Mawr Presbyterian Church. Furthermore, since Philadelphia Presbytery had occasionally offered support and fellowship with JCCP, it was very natural to become affiliated with the Presbyterian Church, U.S.A. In conjunction with the economic boom of Japan, a good number of people came from Japan to the United States for their business purposes. They brought their families; and so, Church membership was rapidly growing in the 1980's. The first Sunday worship service at 6301 Drexel Road, Philadelphia was held on the 9th of September, 1984, after moving from Congregation Beth Messiah. A dedication service of the Church edifice was held on the 16th of September, 1984 at the present location, inviting Mr. Eijiro Fujio from Japan was invited to participate in the service. That was a deeply moving event to every member who was present in the service. Interns were sent from Princeton Theological Seminary and Westminster Theological Seminary to assist. They were Wesley Cummins (1987-1988), Steve Yamaguchi (1987-1988), Thomas Goetz (1988-1989), Taku Kusakabe(1989-1990) from Princeton Theological Seminary, Ken Miyamoto(1990) and Masaki Shiraiwa(1990-1992)from Westminster Theological Seminary. After the resignation of Rev. Shimada in 1991, a Pastoral Change Committee was organized, chaired by Mr. Minoru Tahara to have searched for a new pastor of JCCP. only to find that no pastor was available. Rev. Jonathan Masatake Fujita proposed, after some unsuccessful efforts, to become an interim pastor of our church until we could find a suitable pastor. Rev. and Mrs. Fujita came from Los Angels in August 1991 and worked hard until July 1994 when they left for Nozomi United Methodist Church in Los Angels. One of the biggest tasks for Rev. Fujita was to have found a new pastor for JCCP. The Rev. Benjamin Toyotsune Murata had been Chancellor of Fukuoka Jogakuin, Japan, from 1990-1994. Rev. Murata was born into a Christian doctor's family in Kagoshima City, Japan, on June 7th, 1927. After graduation from Tokyo Union Theological Seminary in 1954, he was sent to the Frontier Mission Church in Shizuoka-ken, Japan. He came to Toronto, Ontario, Canada to study theology at Emmanuel College in 1959. He took a post-graduate course at the Graduate School of the University of Toronto. He and his family came to Canada in 1968 to become pastor of Vancouver Japanese United Church in Vancouver, Canada. They were called by the Toronto Japanese United Church in 1970. Rev. Murata and his family stayed in Toronto until 1990, when he and his wife were called back by Fukuoka Jogakuin to be installed as Chancellor. He and his wife left for a new appointment after receiving a call from the Japanese Christian Church of Philadelphia in May, 1994. Rev. Murata was installed as the ordained pastor by Philadelphia Presbytery on the 17th of July, 1994. After Rev. Murata completed his te-year term, Rev. Hideo Shibakawa was installed as the ordained pastor by the Presbytery of Philadelphia in July, 2005. Rev. Hideo Shibakawa was born in Hokkaido, Japan. After graduating from Waseda University, he worked as a businessman. As a member of a Christian family in which all brothers and sisters are actively involved in Christian ministry, he was an active member of The Gideons International in Japan. After he graduated California Pacific School of Theology, Springfield, Missouri, he served as a pastor of Hiro Gospel Christian Church, Kure Hiroshima, Japan. His wife, Etsuko was an actve memeber of Chirst Doushinkai Church that has been supporting our church. Now we are going to open a new page of our JCCP history with big dreams. At the same time we are looking forward to the future development in the 21 century. Let us pray and work for the purpose of building the Kingdom of God by participating in the work of our Lord through the Japanese Christian Church of Philadelphia. Copyright (C) 2007 Japanese Christian Church. All Rights Reserved.